These are the nuts worth going nuts for. Whether it is taking care of your heart or keeping you upbeat all the day, macadamia nuts can do it all. Various authorities on nutrition and health published information on the incredible nutritional and health benefits of Macadamias – we recommend researching those articles (especially on Omega 7). 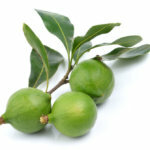 Macadamia nuts contain NO CHOLESTEROL and are a rich source of MONO-UNSATURATED FATTY ACIDS. Research has shown that Mono-unsaturated Fatty Acids have a positive effect on high blood fat levels. Mono-unsaturated Fatty Acids lower the “bad” LDL-cholesterol and raise the “good” HDL-cholesterol in the blood, making Macadamia Nuts an excellent choice in diets designed to lower blood cholesterol levels. A 30g portion of Macadamia nuts contains about 2 grams of dietary fibre, and 18 grams of Mono-unsaturated Fatty Acids (72% of the RDA). People who are very active, e.g. sportsmen and women, teenagers and young children, need a sustained source of energy to keep them going all day. Nuts with their high Mono-unsaturated fatty content can supply sustained energy for long periods. Eating a handful of Macadamia nuts give you an energy boost before, and after training. 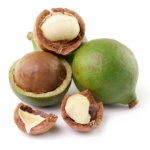 Nuts have formed a part of the human diet for centuries, and Vegetarians know that Macadamias are an important and delicious addition to their diet. 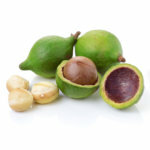 Sprinkled over cereal, added to vegetable dishes and fruit salads, Macadamia nuts add nutritional magic.